If you are looking to take a loan for home renovation or repairs, you have many options to choose from such as a home improvement loan, top up on your existing home loan or a personal loan. Why do we need Home Improvement Loan? Every home demands periodic maintenance work like remodeling, painting, restoration and many more to keep it in a good state. Your house needs your care and attention to maintain its elegance and robustness. Hence, it is imperative to refurbish your home at regular intervals because, with time, natural calamities like rain, storm and normal wear and tear can adversely affect your property. Home renovation can be a costly affair due to the rising cost of material and labor. Hence, at times it becomes important to opt for home improvement loans offered specifically for home refurbishment. There are many loans offers that you can avail for the renovation of your house. Home Improvement Loans are secured loans taken against the mortgage of your property which is to be used for a variety of reasons including remodeling, renovating, updating or making repairs to your home Apart from major work that needs to be done in a house, these loans can also be taken to help you furnish your house and pay for things like bathroom fittings, fans, furniture, etc. These are secured loans. You need a huge amount of money. You want to avail tax benefits. Home Improvement Loans are one of the best options available if you are looking to spend a loan amount to renovate your house and are willing to mortgage your house. These loans have a tenure up to 30 years and are available at attractive interest rates starting from 8.60%. Additional discount of 0.05% is applicable if a woman is a primary applicant for this loan. Eligibility factors for home improvement loans are similar to that of a housing loan. You can apply for house renovation loans either individually or jointly. All owners of a home or property for the renovation of which the loan is availed must be co-applicants, but it is not necessary for all co-applicants to be co-owners. The minimum age at the time of application must be 24 years or above. Repayments have to be completed before the age of 60 years. Any salaried, self-employed or professional individual can apply for a home renovation loan. Proof of identity (Copy of Passport/ Voter ID/PAN Card/Driving License). Proof of address (Copy of electricity bill/ telephone bill/ water bill, Voter ID/ Property tax receipt/ Passport/ Aadhaar Card). Proof of age (PAN card/ birth certificate/ 10th class marksheet/ Driving license/ Passport). Recent passport size photographs and proof of investment (if any). In case of salaried employees: Form 16, last 3 months’ salary slips, Certified letter from employer, Copy of IT Returns for the last 2 financial years. In case of self-employed individuals or businessmen: ITR of last 2 years with the computation of income duly attested by a Chartered Accountant, documents like Profit and loss statement and sales receipts that have been certified by a Charted Accountant. In addition to the above, property documents such as original title deeds, proof of no encumbrances on the property, a proper budget document from the architecture of the proposed work and expected renovation or repair cost from a civil engineer or an architect is required to be submitted to the bank. Check eligibility : Use the bank’s eligibility calculator and will in your loan amount details, income, current obligations and property value to know the maximum loan amount you will be eligible for.Estimate of the eligibility amount can help you determine the loan tenure and loan EMI best suited to you. Submit a loan application form : Fill an easy online application form which contains your personal and loan related details to receive and check the offers based on your requirements and eligibility. Know your loan offer : The home improvement loan offer will detail the loan amount, interest rate, and tenure that you are eligible to get from the bank. The same can be finalised on further discussion with the bank representatives. The loan offer at this stage is tentative to the verification and checks conducted by the bank of your income documents, property documents, property valuation and verification. Submit documents : Submit all the required documents to the bank's executive. Post this, the bank’s representative will call you for the verification of property. Once verified, you will receive a sanction letter from the bank mentioning the details of your loan amount, tenure, and EMI. Approval and disbursal of loan : Once the bank completes its appraisal and documentation formalities, it will give a yes or no decision on your home improvement loan application. If the loan gets sanctioned, the bank will issue you a sanction letter. The sanctioned amount will be credited to your bank account. In case of a secured renovation loan, hand over the original property documents to the bank or any other collateral secured. Before applying for a home repair loan, always compare loan offers of various lenders in terms of interest rates, processing fees, prepayment charges, eligibility conditions and other terms and conditions. 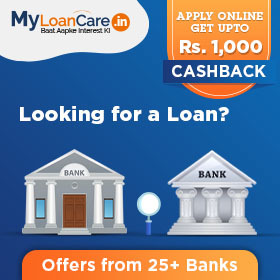 One of the most popular choices is to apply for a loan through online loan aggregator like our platform MyLoanCare which offers loans with minimum documentation and in a hassle-free process. You can compare different loan options and apply for the one with low interest rates. Home loan top-up is an additional loan amount that you can avail on an existing home loan. You are eligible to apply for a home loan top up if you have a running home loan and if you have made regular loan payments on your existing loan. Banks such as HDFC, ICICI, SBI and Axis Bank offer top-op loans at the same interest as that on home loans. In some cases, the interest rates offered on top-up loans can be marginally higher than the interest rate on your home loan. You have an existing and running home loan from a bank. You can apply for an additional loan on your existing loan if you have already repaid a certain portion of the loan and made all the payments in a timely manner. You are keen to opt for a balance transfer loan with a top-up loan which means you shift your loan to a new bank and avail a top-up loan on your existing loan. In either case, you can apply to for a top-up loan with your existing bank or a new bank once you have minimum repayment track record of 1 year on your existing home loan and have already received possession or completion of the financed property. A personal loan is disbursed primarily on the basis of your credit score and annual income. Also, with no requirement of a collateral or security, the documentation involved to get the personal loan is far less as compared to other loans such as a home loan or car loan. Banks such as SBI, HDFC, ICICI and Citibank offer personal loans at an attractive rate of interest. Age : Personal loans for home repair/improvement are available for salaried individuals within the age group of 21 years - 60 years. So, if you opt for a personal loan for home renovation with retirement looming around the corner, the chances of your loan getting sanctioned are lower. But if you apply for a personal loan for home decoration at a younger age, you can easily get the loan. Some banks and financial institutions also provide personal loans to self-employed professionals like doctors, CA, CS, architects etc. Job stability : A salaried person needs to have a minimum of 24 months experience and should have spent at least 1 month in the current profession. Credit score : A good credit score is important to avail an unsecured loan. Generally, a credit score of 750+ is considered suitable for a home repair loan. Delays and defaults in paying loan EMIs and Credit Card bills lower your credit score. So, improve your credit score before applying for a loan. Step1 : Visit MyLoanCare.in and apply for the loan. Step 2 : Fill out the application form which contains your personal details and loan requirements. Step 3 : You can choose to compare different loan options and apply for the one that suits you. Step 4 : Post this, our loan representative will call you and check your eligibility. If eligible, your request will be forwarded to the desired bank. Step 5 : The bank’s representative will call you for the verification of details. Step 6 : Once verified, your amount will be credited to your bank account. Some lending institutions disburse loans within 72 hours, following a small 5-minute approval process. Are there any income requirements for these loans? Yes, each bank has its own income requirement which is specific to salaried and self-employed applicants. The minimum income required is generally Rs. 20,000 and above per month for salaried employees and Rs. 5 Lakh gross annual receipts for professionals and businessmen. Is there a processing fee for these loans? These loans do come with processing fees. The exact amount will depend on the bank and your loan amount. The processing fees for house renovation loans is up to 1% or Rs 10,000 whichever is lower. In case of personal loans, the fee is up to 2% of the loan amount. I am 60 years old. Can I take home renovation loan for 15 years? No, you cannot because most banks consider the retirement age to be between 60 years and 65 years and your loan tenure cannot exceed the retirement age. Is prepayment allowed for home renovation loans? It depends on the type of home renovation loan you have applied for. You can compare interest rates and prepayment charges through MyLoanCare. You can compare different loan options and apply for the one with low interest rates. What happens if my house is destroyed or damaged by a natural calamity while the loan is still being paid back? In such a situation you will be at a disadvantage since the repayment of the loan will have to continue and you'll need to rebuild/repair your house. It is best to buy an insurance policy to cover such eventualities.